After the effort of producing a PCB for the UHF front-end using the toner-transfer and hobby-knife method, I decided to try out more conventional methods. A few yeas ago I designed one PCB with Eagle, a PCB design program. Eagle has a free version for non-commercial use. The free version is limited, but still usable for simple boards. The user interface of Eagle is a bit weird, so I pretty much forgot how to use it. But after spending some time with the on-line tutorial, I got the hang of it and started designing. 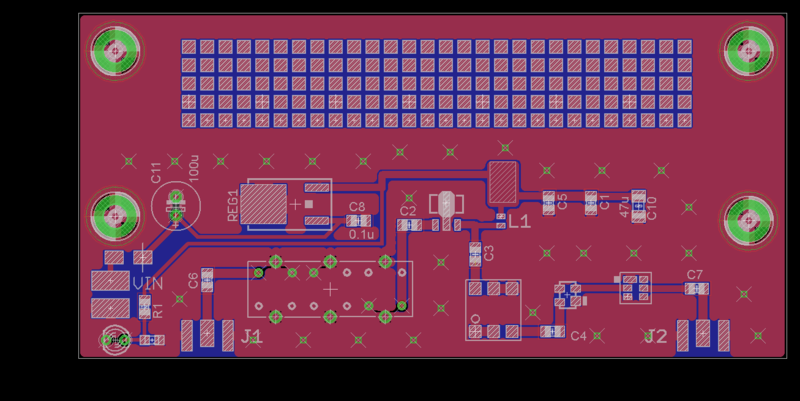 Back when I designed the first board with Eagle, I was very worried about having all the parts I wanted to use in the Eagle part libraries. I knew in theory that you can add parts to the library, but I thought that it is a complicated process that beginners should avoid. But a couple of years ago I worked with a colleague who designed PCB for a joint project (using another program, not Eagle), and I noticed that he routinely added new parts to his library. He did not bother to search very hard for part libraries; he just added every part he needed to use to the library. This is exactly what I did with the UHF front end unit. I added symbols and footprints for almost all the parts it it. This is not hard at all, and the footprints are all specified in the data sheets. 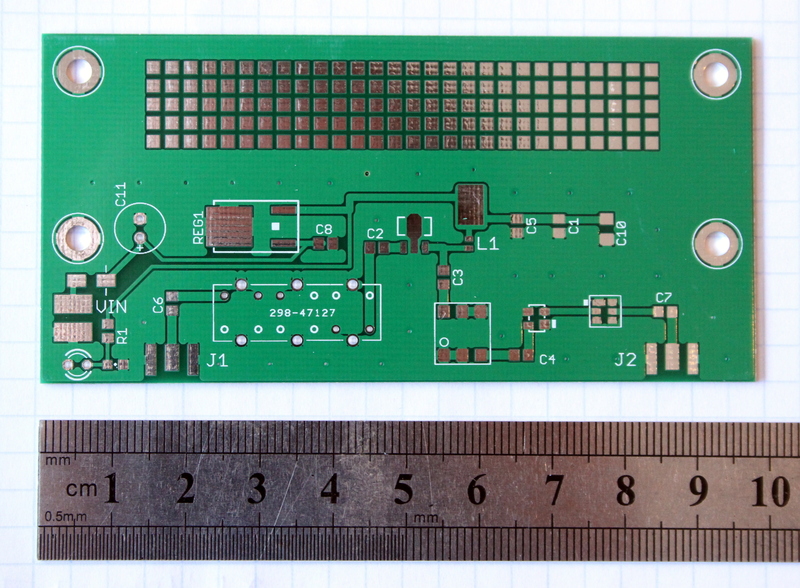 This was the first board I designed for SMD devices, so I was conservative in how densely I placed parts, to ensure that hand assembly would be easy (it turned out that I could make the circuit a lot smaller and still assemble it easily, but I didn’t know that when I designed it). I used mostly 0603-size passives, which I knew I could solder by hand easily. 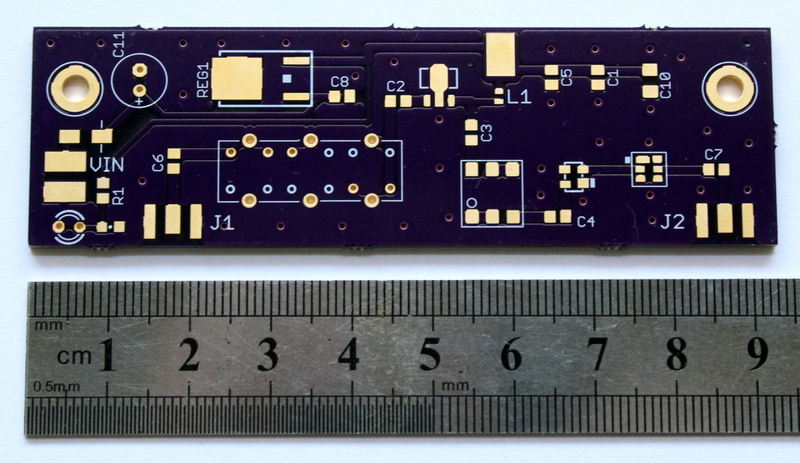 The layout ended up close to 10cm in length, and since the manufacturer I decided to use (iteadstudio.com) has a special deal on boards up to 5x10cm, I made the circuit 5cm wide and used the extra space for prototyping pads. You can see the design and the finished board below. The reason I did not test the boards yet is that shipping from iteadstudio in China was excruciatingly slow (I chose registered mail and I assume that more expensive shipping methods would have been faster). So after waiting for a while, I decided to order a small batch from a low-cost manufacturer in the US, OSH Park. They only offer two types of boards, 2-layer and 4-layer, but the boards arrived more quickly. I used US shipping, which is free in OSH Park. They charge a flat rate per square inch ($5 for 2 layers), so the extra area I added to pad the board to the iteadstudio deal size did not make sense. I removed that part of the design and also shrunk the width a bit. The boards came out very well (and arrived more quickly). OSH Park isn’t expensive either. They make boards in multiples of 3, and 3 of these cost around $20. More expensive per board than at iteadstudio, but still affordable. One nice thing about OSH Park is that the flat per-sq-inch rate also applied to small boards. I ordered 3 other designs from them, all pretty small, at a cost of $0.64 to $1.80 per board, including shipping (in the US)! This is pretty incredible.